The Druid Lane Theatre refurbishment project has been part-funded by the Dept. of Arts, Sport and Tourism under the National Development Plan 2007—2013 – “Transforming Ireland”. Tá an tionscadal seo páirt-mhaoinithe ag An Roinn Ealaíon, Spóirt agus Turasóireachta faoin bPlean Forbartha Náisiúnta 2007—2013 –”Athrú Mór ar Éirinn”. Druid also acknowledges the financial support of Galway City Council towards the refurbishment. In 1979 Druid moved into disused warehouses in what was then an abandoned and run down part of the city. The original fit out of the warehouses, that today make up the theatre, was carried out by members of the company at a cost of £8,000 (€10,000). Due to a lack of funds, apart from running repairs and painting, there had been little done to the building up until the refurbishment commenced in August 2008. 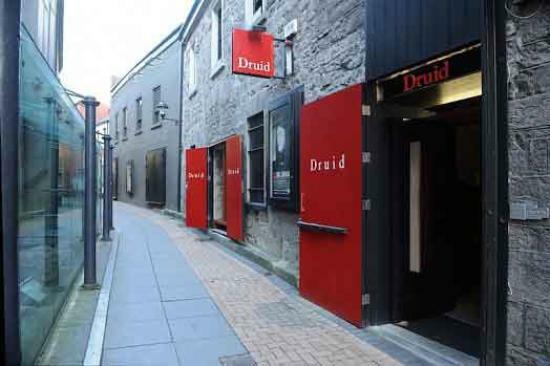 The repair of the building and the renewal of its facilities were essential for Druid to continue to base its activities in the centre of Galway. The refurbishment was completed in July 2009. The refurbishment preserved many of the original features of the warehouses which date from the early nineteenth century and comprise two conjoined two-storey buildings. Much of the underlying stonework is now revealed, including fragments of both architectural and archaeological significance throughout the buildings. The party wall separating the performance and foyer areas may date from the medieval period. Cartographic evidence for a late medieval building on the site from the 1651 pictorial map of Galway City supports this view. As the existing building is a protected structure much consideration was given by the design team to retain the character of the existing building and the new design very much retains the warehouse feel of the original. The refurbishment sees the footprint of the performance space retained but additional space found for the foyer downstairs and rehearsal space and dressing rooms upstairs. In addition the venue gains a flexibility for presenting work throughout its infrastructure. Under the supervision of de Paor Architects, the main work elements comprised: replacing the existing roof over the rehearsal space with a traditional slate roof; a new dressing room, shower room and related facilities at first floor and an increase in size in the rehearsal space, constructing a new roof over the performance space to improve the theatre acoustics, and upgrading all lighting, heating and ventilation. At ground floor level, the work involved the demolition and removal of the existing temporary structure from the foyer, installation of new toilets, upgrading of internal floors with acoustic insulation and traditional timber finish to match existing design and the upgrading of all windows and doors to insulate and acoustically seal the building. The entrance is through a new doorway to the right of the existing entrance and the building is now wheelchair accessible. Druid also wishes to express its continuing gratitude to Thomas McDonogh & Company Ltd. for their support of the company.